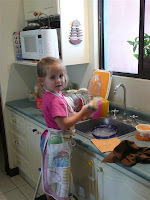 Jordan wanted to help Mom make Lindsay's birthday cake and even help to clean up afterwards! 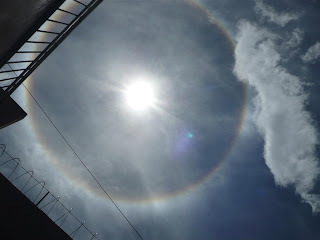 A friend called today to let us know about the rainbow around the sun. I managed to get a decent photo of the "sundog" or ice halo. Scientifically known as parhelion, it's a really cool site to see. You can read more about the phenomenon at wikipedia. 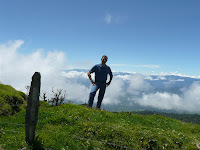 While in the Arenal area, Lindsay and I visited the Hanging Bridges park, where we saw a number of great views and other interesting sights. The following video was one of the most exciting sights. 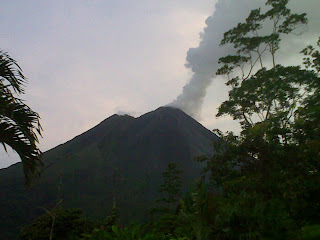 Here's the view of the Arenal volcano from the patio of our hotel room. We are told that the volcano is quite shy, often hiding in the clouds. Must be God's little gift to us today! September 15th is Independence day in Costa Rica (as it is for the five countries of Central America) and is a holiday for us. 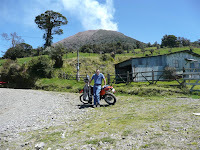 I took the opportunity to go for a (relatively) long ride on my bike to see Volcano Turrialba. The first photo shows the closest I could get, as the road was closed past that point due to the drifting smoke emanating from the volcano. The second photo is looking the opposite direction and sort of makes it look like I'm standing on top of the world. The past two Thursdays, I’ve been leading the first lesson of the new study chosen by our international women’s Bible study group. The study, “Celebration of Womanhood,” is one that we received free from the author, Joyce Marie Smith, and it is proving to be great! I was especially encouraged this week, when the question, “What does Jesus mean to you?” was answered so enthusiastically by several of the women. Two of them were new to the study only last week, and yet they felt comfortable enough to share freely about their faith and how they’d come to know Jesus as their Savior. This week’s discussion easily lent itself to clearly sharing the gospel more than once, which was an incredible blessing! Please pray that the seeds that have been planted would take root in the hearts of these wonderful women and bear eternal fruit in their lives and families. Please pray for the four of us who are taking turns leading to be guided by the Holy Spirit.